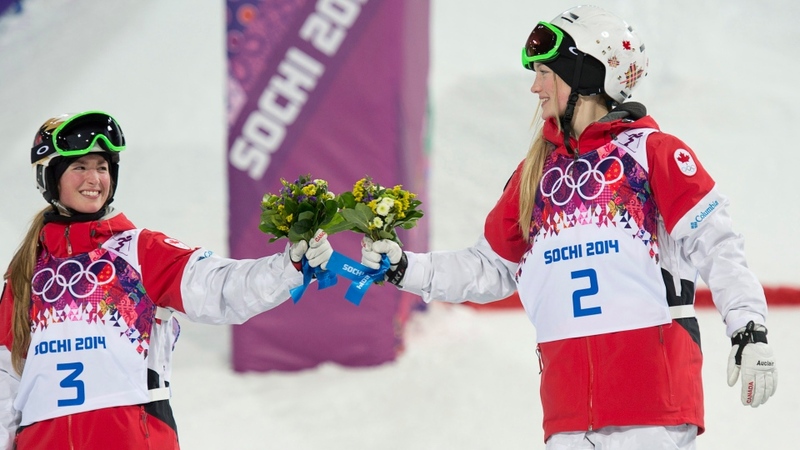 KRASNAYA POLYANA, Russia -- Holding hands with her older sister, Chloe, Montreal teenager Justine Dufour-Lapointe waited to step on the top step of the Olympic podium. With Chloe winning silver, Justine called it a crazy and beautiful moment. For Canada, it was memorable. Moguls gold and silver for the effervescent freestyle skiers on the first day of competition at the Sochi Games. Older sister Maxime placed 12th on Saturday. As her younger sisters worked their way through the maze of media at the bottom of the hill under the lights at Rosa Khutor Extreme Park, Maxime celebrated her 25th birthday nearby as midnight struck. 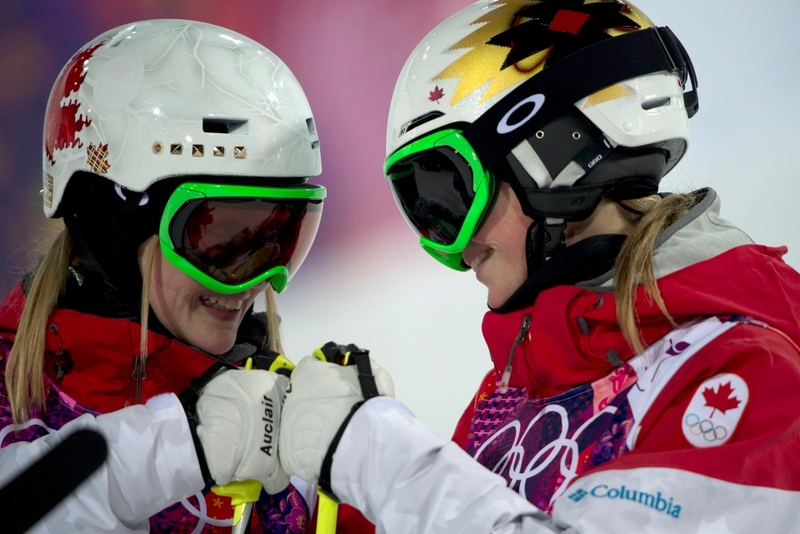 Justine, 19, and Chloe, 22, dethroned reigning Olympic and world champion Hannah Kearney of the United States, relegating the queen of the moguls to bronze while leaving her in tears. The two sisters had near flawless runs once the field was cut to six. Kearney made an error on a turn just after the first jump, then struggled to pull her run back. Justine skied third from last and posted a score of 22.44. Chloe went next, recording a 21.66. Then came Kearney, who could not produce the magic she has so often in the past. Her score was 21.49. "It's crazy. I love so much my sisters," said Justine, who becomes the youngest freestyle ski champion in Olympic history at 19 years 321 days. "We will always share that moment together forever. It's beautiful, just really beautiful." Audrey Robichaud of Quebec City was 10th. 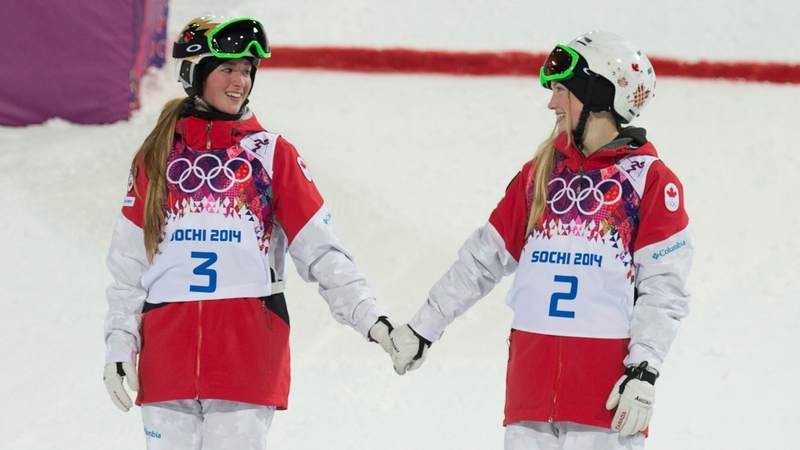 Justine and Chloe are the third sisters to finish one-two in an event at the Winter Games. France's Christine and Marielle Goitschel won gold-silver in the ladies slalom in 1964 and then reversed the order in the giant slalom at the same Games. Canada won gold in women's moguls in 2006 (Jenn Heil) and silver in 2002 (Veronica Brenner). The gold and silver produced wild celebrations among family and friends watching. Yves Lapointe, their father, ran down part of the mixed zone with a Canadian flag flapping behind him. Maxime was serenaded with a chorus of Happy Birthday. On the podium, after the flower ceremony -- the actual medals will be awarded Sunday -- Justine wiggled her hips as rock music blared over the loudspeakers. Later, as the media questioning continued, a Canadian team official with a cell phone hovered nearby. Prime Minister Stephen Harper wanted a word with the sisters. As the crowd thinned, smiling Canadians remained in front of the stands, still drinking in the moment. 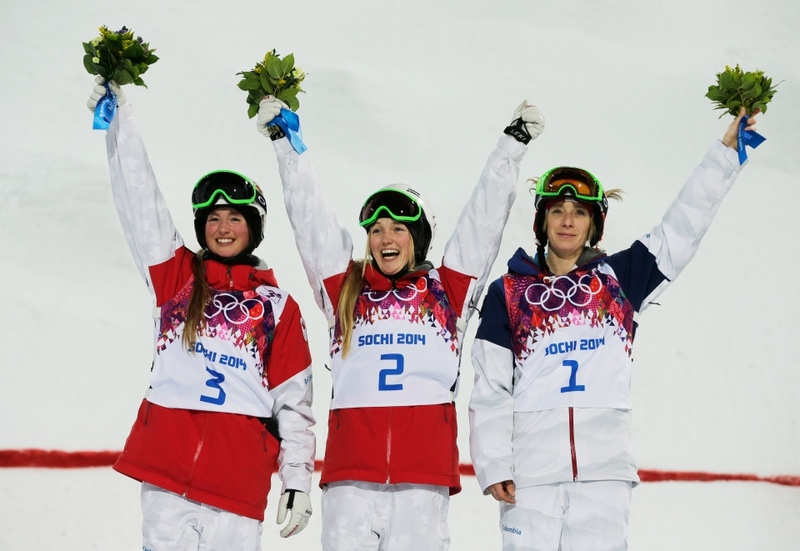 Kearney, the reigning world champion, was bidding to become the first freestyle skier to defend an Olympic title. Canadian Alexandre Bilodeau also has a chance to repeat in the men's moguls Monday. Bilodeau prevented Dale Begg-Smith from winning back-to-back gold in 2010, relegating the Canadian-born Australian to second. Kearney dethroned Heil in Vancouver, with the Canadian taking second. Justine's win means all 25 events in the history of Olympic freestyle skiing have been won by different athletes. Skeleton is the only other Olympic sport whose previous gold medals have been won by different athletes. Kearney, 27, was seen as the woman to beat here. In addition to her Olympic gold from Vancouver, she has won two world championships, three overall World Cup crowns and four World Cup moguls titles. The American has more than 50 World Cup podium finishes, including 37 victories. She captured 16 straight events over 2011-2012, erasing Swedish alpine legend Ingemar Stenmark's record for the longest FIS World Cup win streak in all disciplines. But on Saturday, there was only tears despite becoming just the second American woman (after Shannon Bahrke) to win two medals in Olympic moguls. "I made a huge mistake and you don't win a gold medal at the Olympic Games when you make a mistake," said Kearney, who apologized for her raw emotions saying, "I'm a girl." Kearney leads the current World Cup moguls standings with the sisters second (Justine), third (Chloe) and fifth (Maxime). But the Canadians had been closing the gap in recent months, finishing ahead of Kearney in some events. And the American had a tough night, finishing seventh in Saturday's first run, which cut the field from 20 to 12, with a stumble at the same spot that as the one that cost her in the final. She earned the best score in the middle run but was derailed in the final trip down the course. American Eliza Outtrim, who was sixth, felt for her teammate but said the sisters had skied well all season. "Justine and Chloe skied great runs," she said. "They definitely deserved their medals." "Right now, I would very much like to ski again." Justine said she knew what she had to do in the final run. "It was to go a little bit faster, a bit more aggressive, to give it a little bit more," she said. "And I never stop being focused. I haven't let anyone distract me. This is how I think a champion won a medal." Asked if the best skier won on the night, Justine was definitive. I had the best run, she said in French. The Canadian moguls charge at the Olympics was well-planned, with every detail of the actual competition thought out. "We had four years (since Vancouver) to get prepared," said Chloe, who has shared a World Cup podium with Justine before. "When I set foot in this country I knew I was going to be ready on that date." With three runs -- cutting the field from 20 to 12, then 12 to six and then one final run to decide the medals -- the night moved quickly. "We just gave them the key words, out them in a good place and they did it," said coach Jean-Paul Richard. The phrases to remember were: Stay low with the hips, vision high and attack the course. With the competition starting at 6 p.m. local time and the final run at 10, the Canadian skiers adjusted their sleeping schedule accordingly. They were going to bed at 1 or 2 a.m. and getting up at noon. "I think I'm going to go (to bed) really late tonight," Chloe said with a laugh. Justine's two jumps on the final run were a 360 and back flip (in which she keeps her body right). Chloe did a 360 and a back flip cross. Justine has enjoyed the most success of the sisters of late. In 2013, she won a moguls bronze in her world championship debut and was second in the World Cup moguls standings for the second straight season. She made her World Cup debut in December 2010 and won dual moguls bronze in just her second World Cup start. She reached her first World Cup moguls podium in January 2012 and posted her first moguls win in January 2013. Chloe was the first to compete at the Olympics, placing fifth in Vancouver in 2010. Three years later, she won the FIS world championship in dual moguls and was eighth in moguls. Maxime was a forerunner for the competition in Vancouver. A regular on the World Cup circuit since 2008, she earned her first podium last month with a third at Deer Valley. Maxime said she had no regrets in Sochi despite a few technical mistakes on the night. She said the attention bestowed on the sisters never became a distraction. "It's just normal for us, to be the three (sisters) together," she said. "It is our story. "Family is a strong value for us and we love to share our story." Maxime, who joined her sisters later in the news conference, was generous in praise of Chloe and Justine. "I'm so proud of my sisters, what they accomplished tonight, they 100 per cent deserved it. I've see them train hard, we all did. And I know that they were looking for this result and they made it happen and I think it's amazing how strong physically, mentally, technically they are. "I'm just lucky I'm living in the same house because I can learn from now the two best in the world and be there with them as well." The three are close. They share a Twitter account -- @3--SDL for the three sisters Dufour-Lapointe. American Heidi Kloser, fourth in the standings, tore up her knee and fractured her femur in a crash during training ahead of the first qualification run Thursday. Kearney led after qualifying Thursday, followed by Chloe and Justine. Maxime was eighth. Robichaud qualified ninth. A 17-year-old Robichaud competed at the Turin Olympics in 2006 but missed the 2010 Vancouver Games and is coming off a knee injury. The top-10 skiers earned an automatic berth into the finals, with the rest of the field battling for 10 more spaces in the final via a second qualifying run earlier Saturday. The finals field was then cut to 12 and six to decide the champion. The skiers hit approximately one mogul after another -- the German word "mugl" meaning small hill -- down the 247-metre course. Speed accounts for 25 per cent of final score. Five judges score the quality of the skiers' turns through the moguls for another 50 per cent and two other judges rate the quality of the two aerial tricks and their technical difficulty, making up the last 25 per cent of the score. The hill has a 28-degree gradient, with spectators at the bottom looking up, way up, as competitors bounded out of the start gate to the accompaniment of music from Nirvana to Enrique Iglesias.